I now declare my rewrite of my medieval Russian history papers complete. The section covering the chaotic period from 1584 to 1613 is the last where I made major changes, so here it is. I also moved a section about sailing the “Northeast Passage” (“North to the Orient”) here, from my European history folder, and added a few maps and one or two new paragraphs to the section entitled “The Early Romanovs,” but I don’t think those changes are big enough to warrant retelling those stories here. If you want to check out those sections, go to http://xenohistorian.faithweb.com/russia/ru03.html . And now let’s look at the anarchic time between Ivan the Terrible and Michael Romanov. For 29 years after the death of Ivan the Terrible there was no competent leadership in Moscow. Part of this was Ivan’s fault; in 1581, in a moment of rage, he killed his only promising son (also named Ivan) with a blow from the iron staff he habitually carried around. That left two other sons, the mentally retarded Fyodor and an infant named Dmitri. Unfortunately, with a monarchy you have to take what the royal family gives you, so Fyodor received the crown by default. He spent his 14-year reign saying prayers and listening to church bells, while his father-in-law, a member of the service gentry named Boris Godunov, ran the daily affairs of the country. 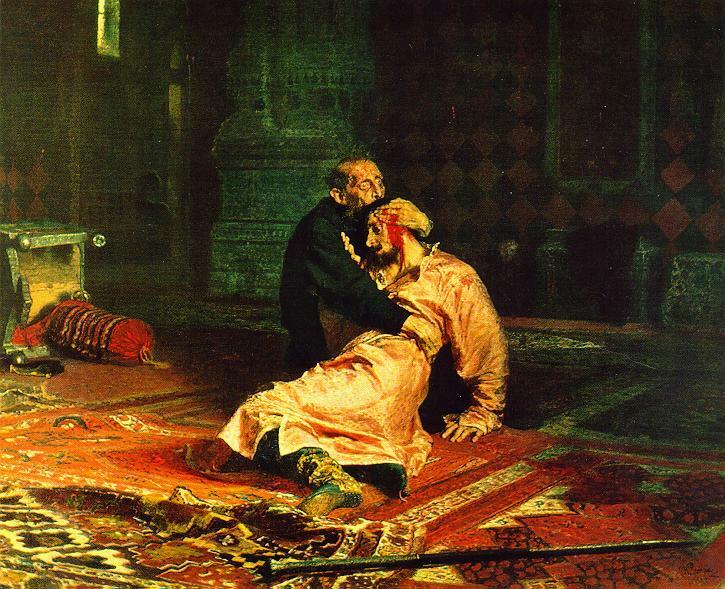 Ivan the Terrible reacts with horror upon realizing that he killed his son. Painting by Elias Repin. Halfway through the "reign" of Fyodor I, his brother Dmitri was found dead with his throat cut. It was never proved whether this was an accident or a murder. Official investigators, appointed by Godunov, declared that Dmitri suffered an epileptic seizure while playing with a knife and killed himself. Some Russians (including the nineteenth century writer Pushkin) believed that Godunov was responsible, in order to give himself a better claim to the throne; it is also possible that a boyar committed the deed, in an act of revenge against the family of Ivan the Terrible. Whatever the case, it was the death of this ten-year-old boy that caused all of the tragic events that followed in this period. Seven years after Dmitri, Tsar Fyodor died childless, and with that the 700-year-old dynasty founded by Rurik came to an end. The Zemsky Sobor elected Boris Godunov to be the next tsar. Boris had proven himself to be a good prime minister, but after he became tsar nothing went right. The people never accepted him wholeheartedly because he could not trace his ancestry to the Rurikide tsars. Many boyars, including the influential Romanovs, opposed him for personal reasons, and the Church denounced his attempt to set up a Western-style university in Moscow as "foreign contamination." Boris accused the head of the Romanov family, Fyodor Romanov, of treason, and exiled him to a monastery outside Moscow, where he was forced to become a monk and change his name to Philaret. Meanwhile, drought and famine ravaged the land, causing armed mobs of desperate men to roam the countryside, plundering the estates of the rich. On top of all this, a mysterious young man appeared (modern historians call him "False Dmitri"), who claimed that Dmitri’s assassins bungled their assignment and killed the wrong boy; now he, the "real" Dmitri, was coming out of seclusion to claim his rightful throne. He went to Poland, promised to make Russia a Catholic country if he gained the throne, and got a Polish army to back him up. Then he marched on Moscow, his band of warriors swelled by Cossacks and peasants along the way. Boris Godunov went to fight him, but bad luck intervened one more time; he had a fatal heart before he could battle the pretender. False Dmitri triumphantly entered Moscow, removed Godunov’s son (Fyodor II) from the throne, and was crowned tsar. The young ruler, whoever he was, only lasted thirteen months. His obnoxious Polish guards & retainers offended the Muscovites. The Russian Orthodox Church was offended because he married a Polish noblewoman after becoming tsar, but allowed her to remain a Catholic. Some Muscovites suspected that he was not even a Russian at all, because he never took a bath. (5)A conspiracy, led by a boyar named Vasili Shuisky, slaughtered the Poles and False Dmitri. Shuisky was elected tsar and he showed what he thought of False Dmitri by burning his remains, stuffing them into a cannon and shooting it off in the direction of Poland. Vasili IV, the "boyar tsar" (1606-10), found himself even less popular than his predecessors. A second False Dmitri appeared, as well as a "False Peter," who claimed to be the non-existent son of Fyodor I. In the south a former slave named Ivan Bolotnikov led a mass revolt of Cossacks, runaway peasants and vagabonds against all authority; the rebellion got all the way to the gates of Moscow before it was driven back. Vasili IV appealed to Sweden for military assistance in stopping False Dmitri II, and the king of Poland, Sigismund III, let Swedish intervention become his excuse to launch a second Polish invasion. The Poles took Smolensk in 1609, and Moscow in 1610; they removed Vasili, and persuaded the boyars to elect Sigismund’s son Wladislaw as the next tsar. 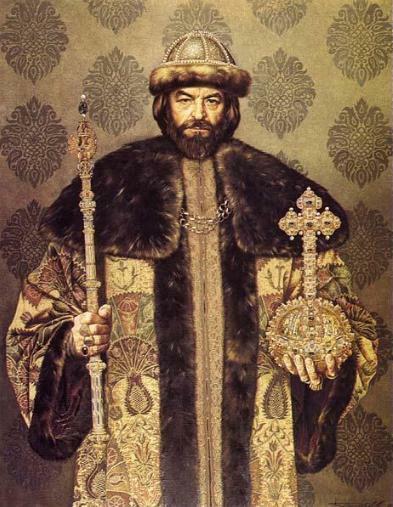 However Sigismund opposed this move, partly because Wladislaw was a minor, and partly because the boyars expected Wladislaw to convert to Orthodoxy, so Sigismund claimed the throne for himself. Later, when Sigismund realized the Russians would never accept him as their ruler, he agreed to a compromise where he would act as regent until Wladislaw came of age. At any rate, the situation in Moscow was too dangerous for the Polish king and prince to stick around, so they left without a coronation taking place, meaning that for three years there was no tsar. To the northwest, Sweden launched its own invasion to get the Poles out of Moscow, taking Novgorod in 1611 and supporting a third False Dmitri’s claim to the tsar’s throne. It looked like Russia would disintegrate completely as a nation, but it was saved by a miraculous reuniting of the people. Since we last saw him, Philaret had become a metropolitan (archbishop), and now he used the pulpit to rally the people in the name of patriotism and Orthodox Christianity; Holy Moscow, the "Third Rome," must not be allowed to fall to the Catholic "heretics" of the West. The Poles arrested Philaret and sent him to Poland as a prisoner, but his message went forth. Russians who heard it gave up one third of their possessions to finance a war of liberation, and soon a great national army–which to the Poles must have appeared to spring spontaneously out of the earth–marched on Moscow, led by a butcher named Kuzma Minin and a boyar named Dmitri Pozharsky. Praying, fasting, and implacable, it wiped out the Poles and liberated Moscow in November 1612, though it would take several more years and concessions of land to get the Poles and Swedes out of Russia altogether. 5. A common practice at the time. Russians bathed regularly but most Europeans avoided it as much as possible, thinking it unhealthy (!) and morally questionable, because the bathhouses of early medieval times were a good place to get your personal possessions ripped off. Is it just me, or is Russian history more depressing than like…. any…. other place or time in world history? Fascinating…. just…. sad and tragic.